Why can’t we just turn off nuclear reactors if something goes wrong? Well, we can stop the chain reaction very quickly by putting in the control rods. But, there’s this extra energy called decay heat that is released even with the control rods in, and we have to carry this heat away or else the reactor will get too hot and compromise the containment systems, possibly releasing radioactive particles into the environment. Decay heat removal is the key factor in many nuclear accident scenarios, and so reactor designers and operators work hard to ensure cooling is robust. Figure 1. Relative power of a nuclear reactor before and after shutdown. The decay heat decreases over a long time and must be cooled. When large atoms like Uranium or Plutonium fission, the vast majority of the energy released comes from the two smaller atoms (called fission products) flying out at high speeds. Once these fission products slow down, their nuclei often remain in high-energy states, which slowly undergo radioactive decay, producing a little bit more heat. When the control rods enter a nuclear core to shut down the chain reaction, all fissions stop and the fission products stop flying around, but the fission products remain radioactive and will produce heat no matter what. 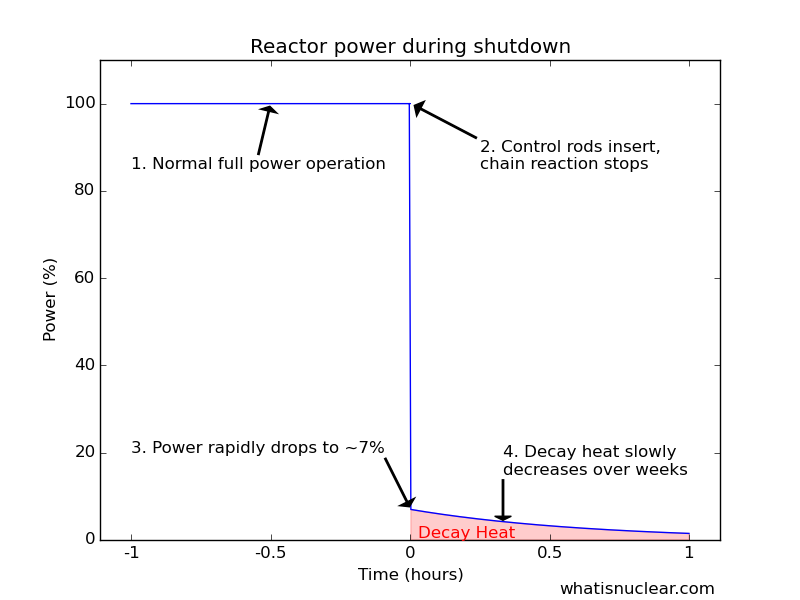 As physics would have it, the decay heat power level is usually about 6-7% of the full power of the reactor immediately after a shutdown. Then it decays exponentially such that it’s below 1% within a day and continues to drop. The problem is, in a 3 large GWt plant, 1% of full power is still 30 million Watts, and that requires a lot of cooling. Since there’s effectively no way to immediately shut a nuclear reactor all the way down, the cooling systems must operate in some fashion after a shutdown or else the fuel will heat up above its melting point and...melt, possibly releasing radioactive nuclides into the environment. This is what happened at Fukushima. Emergency diesel generators as well as some passive systems are typically relied upon to provide this cooling. In some advanced designs such as sodium-cooled fast reactors, the large vat of low-pressure liquid metal allows natural circulation to provide all the decay heat removal without any generators or pumps. Molten salt reactors have fluid fuel that can be drained into a passively-cooled tank that helps ensure cooling. Advanced light water reactors have large pools of water high up where gravity can provide cooling for a long time if the generators fail. In risk assessments, loss of decay heat removal accidents are usually the highest-risk scenario to release radiation to the public. If someone could discover a way that nuclear fission would result in stable fission products instead of radioactive ones, safety and cost issues of nuclear energy would disappear. Unfortunately, this is likely impossible. National Nuclear Data Center -- Find out how much energy comes out in which form. Click a fissionable element like U or Pu. Then click a good isotope like U-235 or Pu-239. Then click the little link that says "Interpreted" right next to (n,fis.ene.release). Tobias, A. "Decay heat." Progress in Nuclear Energy 5.1 (1980): 1-93.